We are always trying to keep you updated on what is new in music. It’s with that in mind that I draw your attention to Exit Eden. They are a new symphonic metal band that comes at you with not only one of the best female voices in modern metal but, four of music’s best female vocalists. The musicianship of their backing band is top notch as well. That right you heard correctly Exit Eden has four of the most beautiful voices associated with them in Amanda Somerville, Anna Brunner, Marina La Torraca, and Clementine Delauney. So brace yourself because their debut- Rhapsodies In Black is set to strike and they mean to draw first blood. 20 seconds into opening salvo “A Question of Time” and just like that you’re off. It takes even less before you get a Lzzy Hale sound to the vocals of “Unfaithful,” which is delivered with the same attitude and swagger as Rhianna and, believe it or not, their take on the Backstreet Boys classic “Incomplete” is actually, second to none. The chorus to “Impossible” is so infectious it should come with the surgeon general’s warning posted on itself, while their cover of the Bryan Adams classic “Heaven” features a great crescendo that takes it from dull to absolutely brilliant. Their cover of the Katy Perry song “Firework” is one of the album’s high points as much as I hate to admit it. They did the Adele original “Skyfall” proud as this one has a slow grow mixed with a huge chorus. “Total Eclipse of the Heart” has all the heft from the Bonnie Tyler original and is twice as epic to become one of the real, stand out tracks and the band’s superb version of “Paparazzi” by Lady Gaga should have closed the set, but sadly didn’t. 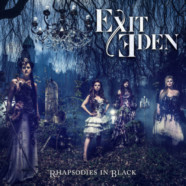 Here’s the bottom line- If you like four female voices and a classic metal opera style then Exit Eden is for you.